Japans first Super bike is still the worlds biggest-selling 750; but whats it got thats made it so prominent in the myths and legends of modern motorcycling? DAMMIT, is the Honda 750 really all things to all men? In the final analysis, yes, or at least able in a better-than-average fashion to satisfy the average demands of motorcyclings cross-section. Thats a very successful formula. The current model follows the same concept, yet is quite a different machine from the one that set the world a twitter four years ago. Hondas practice of unobtrusive production-line evoloution has resulted in a quieter, less powerful, better handling, more reliable machine than Old Original. It still goes hard, yet it has been overshadowed by the demon chargers of the past two years. It is still far from the tops in handling. It still keeps you away from petrol stations. It still feels as smooth as silk under normal conditions. When the four-cylinder power-plant first saw the light of day, at represented technical innovation Overall feeling was one of admiration tinged with reservations as to what it would be like to repair. Two things quickly emerged the motor was extraordinarily reliable. and when repairs were called for the processes proved to be quite simple despite the multitude of parts. The two are to some extent interconnected. In detail design the unit bears the unmistakeable stamp of Honda. Technical problems have been solved by brilliant ideas that never the less leave the impression that there must be a simpler way to solve them. The methods used to restrict engine width are perhaps the most notable in this respect. Both primary and camshaft drives are taken from the centre of the crankshaft by adjacent chains, the cam a single row, and primary drive a duplex. This saves either of the drives from being hung off the side of the engine block, but forces a departure from normal in the transmission case. The main shaft extends as usual to the left of the driven sprocket, but theres room for shaft and gears only before the left hand limit of crankcase width is reached, so the clutch operating mechanism, normally on the end of the main shaft, is swapped over to the right. The clutch inner is turned to face inwards and thats the way the plates move on disengagement. The location of the counter and layshafts is fairly much the same as the next bike, but. the end of the countershaft is still too far to the left to mount the final drive sprocket anywhere in line with the wheel. So what did Honda do? They placed a shorter idler shaft at the rear of the box to carry the sprocket. Then they left any mention of its step-down ratio out of their brochures and owners manuals, leading one respected American journal to calculate recently that the bike was geared to pull 233 km/h (145 mph) at the peak power figure of 8000 rpm. This possibly accounts for some of the incredible claims weve heard over the years from proud owners, who may have used only the tacho reading and brochure-supplied gear-ing figures to assume their 201 km/h (125 mph) two-up with fully loaded panniers and using only three-quarters of the twist grip calculations are completely accurate. We cant be smug; we always assumed the published internal reduction ratios included the figure for the output shaft, and spent several frustrated hours proving that the theoretical 227 km/h (141 mph) we achieved was in fact what it had felt like  195 km/h (121 mph). And even that we dont feel like that claiming as a top speed. Not because of any calculations or gearing problems, but because it took so long to reach. The Honda proves how nebulous a figure this top speed quantity is. Using the more conventional method of a 2000 m (just under 1.25 miles) standing start and timing two ways produced 182 km/h (113 mph), which is right in line with the bikes demonstrated power. But and this is the big but  the 750 will run faster. However, because of the very flat torque curve, peak power right on the red line, and some funny calculations involving gearing, wind resistance and rear wheel power which are right outside the scope of a road test, it takes one helluva long time to do it. Given about seven kilometres the bike would probably peak at about 200 km/h (124 mph). An interesting comparison can be drawn with the Kawasaki 750. 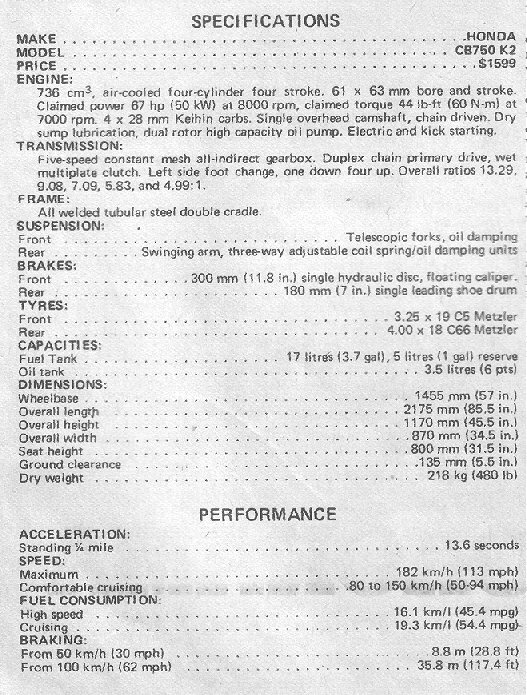 The Kawa, because of its power-band and gearing, reaches its top of 186 km/h (115.5 mph) well within the first two kilometres; should one bike of each model take off together, we calculate the Honda would take at least six kilometres to get ahead, despite the significantly higher speed at that time. Were not boosting the Kawasaki by comparison to the Honda  merely showing that top speed is an awkward quantity to use when comparing different machines. In an attempt to establish a consistent basis for reference, we quote the speed at the end of a standing start 2000 m.
The key area in any hard-revving motor is the crankshaft, and with the Four Honda opted for basic strength in the form of a one-piecer. With such a system, bearings and lubrication are of vital importance, and here they've not gone in for any technical wizardry. Instead the time honoured method of plain big-end and main bearings couple with an efficient dry-sump lubrication system got the nod. With a high-capacity double rotor pump and big filter as part of the set-up, it handles transmission lubrication duties as well, and does so easily by all accounts. Tales of Honda Fours overheating or destroying crankshafts are rare, even in competition versions putting out anything up to 100 hp (75 kW). Up on the top end of the motor everything is crowded but orderly. The single camshaft sits squarely in the middle of the head supported by plain bearings blocks, while conventional tappet adjusters, accessible through caps in the cam box, look after valve lash. The Hondas ignition is a normal battery/coil set-up. The two outside pistons have their crankpins disposed at 180 deg to cylinders two and three, and each of the two ignition coils fires one pair of pistons, a waste spark being delivered at the end of the exhaust stroke. The starter motor, mounted on top of the transmission case behind the barrels spins the motor via a pinion mounted on the left-hand end of the crankshaft, inboard of the alternator. All-in-all the motor is a truly formidable device in terms of the number of parts it contains, yet despite Hondas seemingly roundabout way of overcoming some of the problems encountered it has built up an enviable reputation for reliability. Complex it may be, fragile it isnt. Theres no suggestion of fragility in the bikes looks. Instead the main impression is of bulk  that comes from the motor seeming to take up all the available space as well as spilling out to the sides. Tacking a zoopy looking petrol tank on top of such a motor would be very much a stylists gamble and a long-odds one at that, so Honda have wisely settled for a plain and solid looking tank which reinforces the impression of bulk. The bike doesnt look like a pregnant whale, but it hasn't got the lines of a gazelle either. The same impression of bulk is carried across to its behaviour on the move; changes of line are preferred with a type of ponderous inevitability, and only after distinct effort on the part of the rider - For all that, the handling is far from bad, its steadiness being one of the best factors. Other Honda Fours we've ridden, particularly the earlier models, had the bad habit of reacting sluggishly to the steering on low-speed bends, and then suddenly flopping right over, a disconcerting way of approaching a corner. With the test bike little of this peculiarity was found, and we were darkly suspicious of the published steering geometry figures because the problem is patently a product of the bikes steering. Couple a steering head rake of 27 deg with a trail of only 9.5 cm, hang it on the front of a heavy machine with much of its weight forward and high, and you must get the classic Honda 750 handling traits. In other words, initial steering effort will be high, yet the bike wants to flop over as movement propesses. Yet the test machine, supposedly the same as ever the model has been, didn't exhibit these habits as much as expected. The answer, according to riders experienced with the bike, lay with the front tyre, in this instance a Metzler Block in place of the original equipment rib pattern. We cant argue: there definitely seems to be an interaction, and the only comment we can make is anybody who buys one and doesn't fit a good block pattern front tyre is off his little head. The difference is remarkable. The basic reluctance still remains, of course, it being a function of weight location as much as steering. Taking high speed bends on the 750 calls for a lean-off style which accomplished two things. First, it seems to get things cranked over with less effort, and, secondly, the rider has greater control over the bikes tendency to lay right over (which though modified, still persists). Under those conditions the machine is great fun to ride, particularly as the ground clearance is as generous as one could desire. 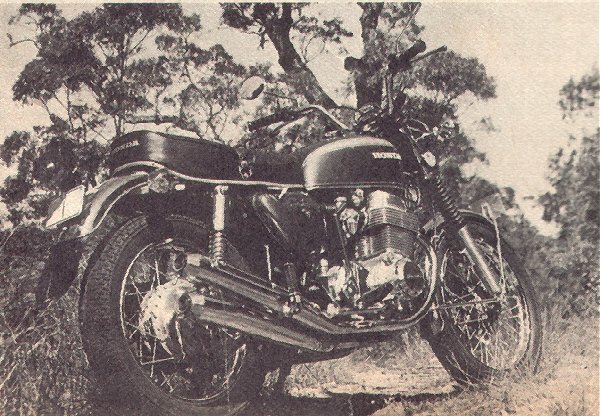 The test bike was somewhat better in that respect than the average, having spent the first 1000 km (621 miles) of its life as a travelling marshall's mount during the Castrol Six Hour. Modifications included flats worn on the side and centre stands and chunks eaten out of both rider and pillion footrests on the right hand side. The bike had to be a long, long way over before any of these points touched (we did it only once each side) and even unmarked machine can crank over to very respectable angles before pounding. The Honda is still too much for its suspension, although recent changes have seen a marked improvement. This is particularly evident in the forks which offer reasonable damping combined with medium movement. Even the notorious rear suspension units have improved, still not to the level required for pushing hard, but at least an improvement. Both springing and damping are too soft, the rebound damping especially being below par. Then again, one has to push hard on ripply surfaces before the dreaded hobby horsing begins. Another habit of the bike which is potentially more disturbing is more a function of the frame and steering. Hitting a single small bump when cranked over and accelerating hard seems to be more than the long swing arm, and side frame cradle can take. The resultant twisting out of line of the rear wheel is translated via the steering to a scary twitch up front. This is where the road testers approach to things can come up with a slightly biased answer. Since a bikes ultimate potential is an important function to determine, we spend the larger part of our time on the road in, or close to, desperate situations. Thankfully, not everyone rides like this. most Honda Fours are ridden at medium speed with medium verve by people of medium talent. And under those situations, they handle fine. Exactly, the same applies to the motor. In the lower ranges, below 4500, it exhibits extraordinary	smoothness, while above that its little better than many others, sending a fine tingle through bars and foot pegs, and sounding mechanically fussy. Yet 4500 represents more than 110 km/h (68 mph) in top; the motors torque below that figure (from 2500 in fact) is only a shade below peak value, so what is the natural thing to do? Right! Change at about 5000, and enjoy incomparable smoothness, adequate acceleration and a brisk cruising speed. Allied with the low-range smoothness is a suddenness of response that verges on the uncanny. Blipping the throttle at a standstill leads to the impression that theres an electric not internal combustion motor, tucked away under the tank.The flywheels are light,power pulses come often and the result is instantaneous rise and fall of revs in response to the throttle opening. The two way positive cable also helps to reinforce this impression. When the motor is cold, it can be quite embarrassing, so suddenly do the revs die off at gear changes that it takes a practised wrist to shut off the precise amount needed to match with road speed and avoid a clank from the transmission. The Hondas early quickness doesn't extend through the range. Its low range torque is more that adequate, but becomes no higher in the 5 to 7000rpm bracket when most other super bikes start laying it down in tyre shredding fashion. This performance is allied with the need to take a double hit to wind the twist grip all the way to the stop,, another reason why the Honda feels so capable in the middle ranges and is kept there by most riders. No matter how hard the bike is working, the exhaust gives little clue to how much, the harty growl of the earlier models has been muted significantly. It's a good thing that the tacho is so responsive. No matter how fast revs rise, and they can be mighty quick, the clock stays right with them. Over reving is easy to catch in time. On the question of noise, the transmission scores a black mark to the exhaust's god one. Perhaps it is a proliferation of chains and straight cut gears, but the clatter from below can lead the uninitiated to think they have been landed with a lemon, and is out of character with the machine's quality image. With the transmission, like the bottom end, has proven over the past few years to be the equal of anything around when it comes to absorbing punishment. The test bike representer even a further step forward in the clutch department. Honda/4 clutches have always been light in action, but this one almost defied description with its lightness and smoothness. We have ridded 125's with heavier clutches than this bike. It was beautiful, and made a normally over-quick take-up (the units only drawback usually) easy to overcome since fingertip control alone was needed to pick accurately the friction point. For all that, it gave no trouble during the test. The first acceleration run bedded it in, and after the one adjustment no more were needed. While the clutch was light, the gear change erred towards the stiff side, without losing a welcome preciseness. On occasion, neutral proved difficult to pick when stationary, and most changes were accompanied by a gentle click, but theyre the only complaints we can level. 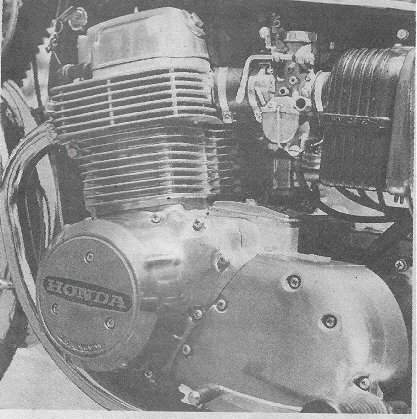 Even the noise on changing could be all but eradicated by careful adjustment of rear chain tension; the exception was the clonk on engaging first, which persisted, although it wasn't as pronounced as we've come to expect from the Honda Four. As the first mass-production machine with a disc brake, the 750 could be expected to have lagged behind more recent developments in that field. Such is not the case, and both anchors performed well. Of special interest was the great feel and progressiveness offered by both disc and drum. The rear brake was powerful enough to lock the wheel  a situation aggravated by the bikes forward weight bias and the hard compound in the 4.00 x 18 tyre, so we were anticipating problems when the time came for the panic stops. No such trouble  the wheel could be kept hovering on the brink of a mad slide from all speeds. Backing off when it started to squeal had braking effort relaxing by the required amount and no more. 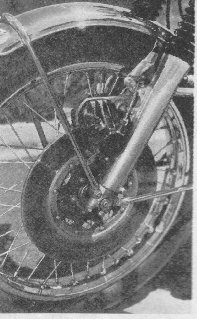 The front brake was hampered in overall power by a seemingly over-hard disc material, which also refused to provide bite in the wet. The earliest of the K1's had a different metal which, despite tending to rust slightly, gave far better bite  the harder alloy of the current disc has gone too far the other way. Although the Four has never been promoted exclusively as a tourer it has many of the attributes of this type of bike. The riding position is a case in point: the foot pegs seem at first to be set too far back, but they allow even the longest-legged rider to fit his knees down and around the wide tank. The thick seat takes a long while before it causes any discomfort to the nether regions, and the switches and controls are all simple and well laid out. The only exception to this we could take would be the left-hand switch block, carrying the indicator switch and a combined passing flasher/horn. The indicator switch is set a hair too high, so that a blind reach with the thumb sometimes connects with the other control below. This slides for flashing and pushes in for the horn, and it is fairly awkward to do one without the other, the result being that on occasion our intention to indicate a right-hand turn was translated as a blast on the horn (quite a loud unit too) and a flash of high beam. And of course. Honda still persist in placing the ignition lock under the forward edge of the petrol tank. Despite having four carbs, the economy of the 750 is enough to make many a 250 two-stroke owner weep. Our overall test rate was 16.9km/L (50mpg), which would easily top 20 (65 mpg) under touring conditions, for a range in excess of 350 km (217 miles). Were not completely convinced the reserve (5 litres) should be as large as it Is: It could be easy during general running around to get blase about the amount still left and have the need for a top-up slip the mind. We had a ball testing the Honda Four. Everything worked so well that riding was a pleasure, end there was an extreme reluctance to return it to Bennett Honda at the end of the period. Yet the deed of derring-do which normally nuke up large parts of a road test had been curiously absent. Upon reflection we realise that this is the bikes nature,, it makes you cool it somewhat.If you want to really get stuck into winding hill roads and doubthful surfaces at high speed, you are a little out of the bikes depth. Nor will you knock off your local "stop light grand prix" experts. Odds are they will be on Kawasaki's,, again, too big league for the Honda. Nor is this bike completely easy to use in the Sydney train strike traffic we encountered on a couple of days. So where is the bike at?? Simply, it does nothing badly. It may not be superlative in many areas, but is has the drop on the rest of the world as far as failings go. And when you consider it, perhaps that is hardest of all to achieve. The bike is not the prettiest in the world, but lines are neat and distinctive. The New South Whales No. 1 plate is always proudly carried by Bennett Hondas demonstrator flagship. Pose value a inestimable. Look under the tank and all you11 see is motor. The four-cylinder unit takes up all the available space. 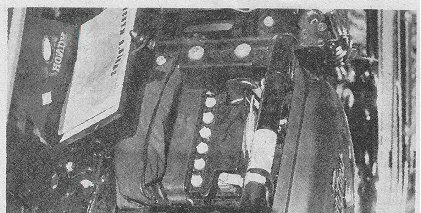 Note the simple choke lever snap-on float chambers for the carbs, and Hondas continued insistence on placing the ignition lock in the awkwardest possible location. Under the seat is crowded but orderly. New for this year is the document cubby-hole, shown here hinged down. Tool kit is inadequate, and shoddy. Instruments are neat and legible. The tachometer has the fastest reflexes in the business, absolutely necessary to keep up with the motors lightning quick response. First in mass production, and still able to cut it.The 750's single disc brake features a capilar which is attached to an alloy bracket pivoted off the fork leg. Normally single piston systems have the capliar sliding on seperate lugs.